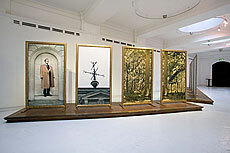 The work takes viewers on a journey of the imagination as they follow a young business man from the heart of the City of London, symbolized by the imposing exterior of the Bank of England, into the depths of a forest. There, the magical figure of a beautiful woman, her head crowned with a set of deer antlers, is glimpsed in a sun dappled glade. Finally, in front of the glittering gold mosaic walls of a city interior, the young man kneels before the woman, standing tall and splendid before him, her antlered presence at the heart of the city a symbol of the greater power of nature which surrounds it. The work was inspired by two paintings in the National Gallery: “The Death of Actaeon” by Titian and the fourteenth century altarpiece the Wilton Diptych. The new work brings together the motifs of royalty and the hunt from the historic paintings and brings them up to date. The king shown in the altarpiece becomes a young businessman, photographed posed like a statue in one of the empty niches in the walls of the Bank of England. Next, photographs shot in Richmond Park, formerly a royal hunting ground, show a beautiful young woman reclining in a dappled glade, wearing the antlers, attributes of the deer that kings once hunted there. 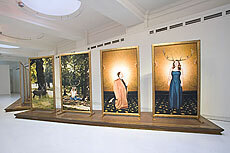 Lastly, the young man is photographed kneeling in front of the woman, now wearing a blue gown and the headdress of antlers, before the golden mosaic walls of a historic city interior, a restaurant located very near to the Bank of England. Its glittering walls symbolize both the wealth held in safe keeping in the bank so close by and the golden background of the Wilton Diptych altarpiece. In all the photographs, the businessman wears a tie with a stag motif running across it and, on his coat, a brooch representing a stag’s head, its antlers made of gold. The tie and the brooch symbolize the young man’s awareness that, even in the heart of the city, where his power is based, there is a greater power, that of nature, symbolized by the young woman, before whom he eventually kneels barefoot in worship. Exhibition credits can be found on the exhibition website.